In Egyptian mythology, Osiris was killed on the 17th day of Athyr, the third month of the ancient calendar. Though not acknowledged, 17 seems to be a very meaningful number in the Mystery traditions, sort of equivalent to the Cross in Christianity. It symbolizes an unjust death and the promise of rebirth. Incidentally, Lazarus, whom many Biblical scholars believe was an adaptation of Osiris (Lazarus coming from El Ausur, Hebrew for "the god Osiris") was raised by Jesus in John 12:17. One of Lazarus’ sisters was named Marta, which means ‘mistress of the house’, the exact meaning of Nephthys. The first officially acknowledged Masonic body, the Grand Lodge of England, was established on the Feast Day of John the Baptist in 1717. The most powerful Masonic body in the World, the Supreme Council of the Scottish Rite has its headquarters on 1733 16th St. in Washington, DC. There are 33 degrees in Scottish Rite Masonry. Orion was identified with Osiris, who again died on the 17th day of the third month. "Month," of course, derives from the root word moon. 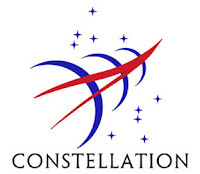 So how many crescent moons do we see on the Orion 17 mission patch? Additionally, the so-called “Sacagaewa” dollar (the actual woman on the coin is unnamed), which was minted in the year 2000, depicts a woman and a male infant on the obverse and an eagle surrounded by 17 stars on the reverse. The alleged “Sacagaewa” wears an earring depicting a point in a circle, which Freemasons associate with the seed of Osiris in Isis’ womb. 3/17 is also the date of a Masonically-created holiday, St. Patrick’s Day. The story has it that the holiday was established by high level Freemason, George Washington, allegedly to reward Irish soldiers in the Continental Army. But “St. Paddy’s” has traditionally been a very minor Saint’s day in Ireland. Considering that the day has become America’s defacto Bacchanal (which takes us back to Osiris) it’s worth noting some of the parallels of this day with Solar mythology. • St. Patrick’s Day is five days before the Spring Equinox, associated with the rebirth of Osiris. Most astrologers believe that we are entering the Age of Aquarius, where the Sun will rise in the constellation of Aquarius for the nest 2,000 years or so. Hippies and New Agers celebrate the new age as one of peace, understanding and consciousness. Occultist Aleister Crowley named this new age "The Aeon of Horus." He wrote about this in several of his works, including his novel, Moonchild. His vision of the new age was one of war, cruelty and chaos. 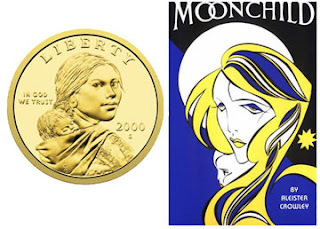 On the right is the cover of Moonchild. 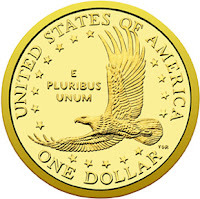 On the left is the obverse of the Sacagaewa dollar.